I’d like to make it look cooler. Now that I have completed the outfits I too want a navy blue cape! I just love mustard with navy blue… but it has been seen A LOT. So rather than doing a color block style combo, I went for details like a flowy victorian blouse which sleeves and high collar that will graciously peek out of the cape. I contrasted the large cape with tight jeans which used fabric brings a cool feel. For the colors, I chose to oppose the cold shades of the big pieces toward the warm shades of the accessories. Don’t get me wrong, I am not suggesting you go pantyless under your cape. Merely suggesting you to wear something shorter than the cape. Then the look is all about beautiful tights, boots and creative accessories. Once again, I balanced the large upper part with a super fitted and almost invisible bottom (aka legs). The stars are your legs! Choose your tights wisely. For this last style, I contrasted the masculine stiffness of the cape with the feminine fluidity of the skirt. 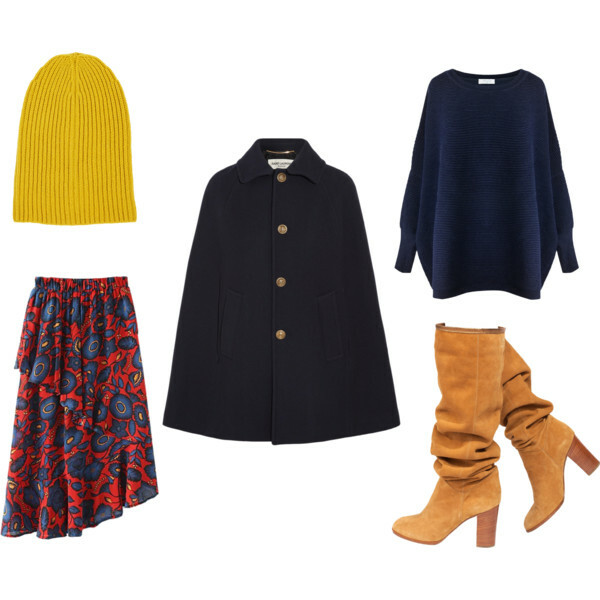 Navy blue looks always amazing with warm colors such as red, yellow and camel. Hope I inspired you to wear your cape! Ah! Ca me fait plaisir!